We are very pleased to announce that Google has committed to support DebConf19 as a Platinum sponsor. "The annual DebConf is an important part of the Debian development ecosystem and Google is delighted to return as a sponsor in support of the work of the global community of volunteers who make Debian and DebConf a reality" said Cat Allman, Program Manager in the Open Source Programs and Making & Science teams at Google. Google is one of the largest technology companies in the world, providing a wide range of Internet-related services and products as online advertising technologies, search, cloud computing, software, and hardware. Google has been supporting Debian by sponsoring DebConf since more than ten years, and is also a Debian partner sponsoring parts of Salsa's continuous integration infrastructure within Google Cloud Platform. With this additional commitment as Platinum Sponsor for DebConf19, Google contributes to make possible our annual conference, and directly supports the progress of Debian and Free Software helping to strengthen the community that continues to collaborate on Debian projects throughout the rest of the year. Thank you very much Google, for your support of DebConf19! DebConf19 is still accepting sponsors. Interested companies and organizations may contact the DebConf team through sponsors@debconf.org, and visit the DebConf19 website at https://debconf19.debconf.org. Registration for DebConf19 is now open. The event will take place from July 21st to 28th, 2019 at the Central campus of Universidade Tecnológica Federal do Paraná - UTFPR, in Curitiba, Brazil, and will be preceded by DebCamp, from July 14th to 19th, and an Open Day on the 20th. To register for the event, log into the registration system and fill out the form. You will be able to edit and update your registration at any point. However, in order to help the organisers have a better estimate of how many people will attend the event, we would appreciate if you could access the system and confirm (or cancel) your participation in the Conference as soon as you know if you will be able to come. The last day to confirm or cancel is June 14th, 2019 23:59:59 UTC. If you don't confirm or you register after this date, you can come to the DebConf19 but we cannot guarantee availability of accommodation, food and swag (t-shirt, bag…). In an effort to widen the diversity of DebConf attendees, the Debian Project allocates a part of the financial resources obtained through sponsorships to pay for bursaries (travel, accommodation, and/or meals) for participants who request this support when they register. To promote diversity: newcomers to Debian and/or DebConf, especially from under-represented communities. 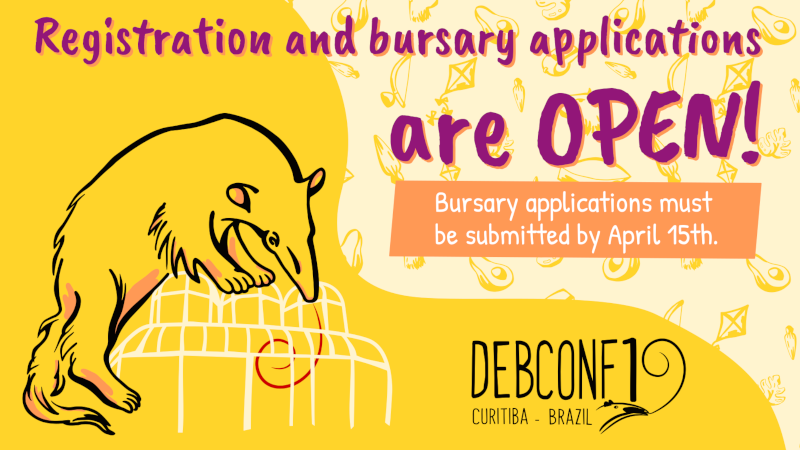 Giving a talk, organizing an event or helping during DebConf19 is taken into account when deciding upon your bursary, so please mention them in your bursary application. DebCamp plans can be entered in the usual Sprints page at the Debian wiki. Attention: the registration for DebConf19 will be open until Conference, but the deadline to apply for bursaries using the registration form before April 15th, 2019 23:59:59 UTC. This deadline is necessary in order to the organisers use time to analyze the requests, and for successful applicants to prepare for the conference. DebConf would not be possible without the generous support of all our sponsors, especially our Platinum Sponsors Infomaniak and Google. DebConf19 is still accepting sponsors; if you are interested, or think you know of others who would be willing to help, please get in touch! We are very pleased to announce that Infomaniak has committed to support DebConf19 as a Platinum sponsor. "Infomaniak is proud to support the annual Debian Developers' Conference", said Marc Oehler, Chief Operating Officer at Infomaniak. "The vast majority of our hostings work using Debian and we share this community's values: promoting innovation whilst ensuring that security, transparency and user freedom remains top priority." Infomaniak is Switzerland's largest web-hosting company, also offering backup and storage services, solutions for event organizers, live-streaming and video on demand services. It wholly owns its datacenters and all elements critical to the functioning of the services and products provided by the company (both software and hardware). With this commitment as Platinum Sponsor, Infomaniak contributes to make possible our annual conference, and directly supports the progress of Debian and Free Software helping to strengthen the community that continues to collaborate on Debian projects throughout the rest of the year. Thank you very much Infomaniak, for your support of DebConf19! Debian is applying as a mentoring organization for the Google Summer of Code 2019, an internship program open to university students aged 18 and up, and will apply soon for the next round of Outreachy, an internship program for people from groups traditionally underrepresented in tech. Please join us and help expanding Debian and mentoring new free software contributors! If you have a project idea related to Debian and can mentor (or can coordinate the mentorship with some other Debian Developer or contributor, or within a Debian team), please add the details to the Debian GSoC2019 Projects wiki page by Tuesday, February 5 2019. Participating in these programs has many benefits for Debian and the wider free software community. If you have questions, please come and ask us on IRC #debian-outreach or the debian-outreach mailing list.